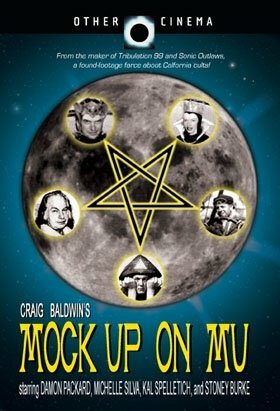 A radical hybrid of spy, sci-fi, Western, and even horror genres, Craig Baldwin's Mock Up On Mu cobbles together a feature-length "collage-narrative" based on (mostly) true stories of California's post-War sub-cultures of rocket pioneers, alternative religions, and Beat lifestyles. Pulp-serial snippets, industrial-film imagery, and B- (and Z-) fiction clips are intercut with newly shot live-action material, powering a playful, allegorical trajectory through the now-mythic occult matrix of Jack Parsons (Crowleyite founder of the Jet Propulsion Lab), L.Ron Hubbard (sci-fi author turned cult-leader), and Marjorie Cameron (bohemian artist and "mother of the New Age movement"). Their intertwined tales spin out into a speculative farce on the militarization of space, and the corporate take-over of spiritual fulfillment and leisure-time.